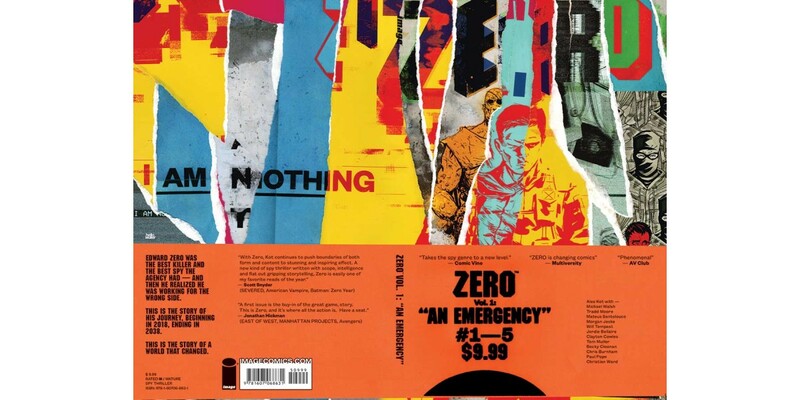 Ales Kot’s (CHANGE, Secret Avengers) gripping spy thriller ZERO: AN EMERGENCY, VOL. 1 is the inaugural collection of the hit ongoing series, arrives in stores in February for the low price of $9.99 from Image Comics. Edward Zero is the perfect execution machine—a spy who breaks the rules to get things done, fighting terrorism all over the world. Zero was the best spy the Agency had—and then he realized he was working for the wrong side. With art by Michael Walsh, Tradd Moore, Mateus Santolouco, Morgan Jeske, Will Tempest and Jordie Bellaire, ZERO’s art is as varied and provocative as its pulse-pounding storyline. ZERO: AN EMERGENCY, VOL. 1 (ISBN: 978-1-60706-863-1) collects issues 1-5 and arrives in stores on 2/19 at a special introductory price of $9.99. It can be pre-ordered using Diamond Code: DEC130554.